A simple 20 payline slot with stacked symbols and a low to medium variance. Players can score some nice payouts during base play and there’s always a chance for one of the four jackpots to be won. 20 Diamonds is a video slot coming from EGT. This is quite a simple game with a fast gameplay and pretty much no bonus features. Still the slot has the potential for some big payouts thanks to stacked symbols on the reels and a rich paytable. If you like playing simple games 20 Diamonds is guaranteed to catch your attention. For this slot the EGT designers decided to go with a Gems theme. The visual details of the slot are great, with modern animations and high symbol details. The designers also used bright colors to give the slot a luxury appearance. The gameplay in 20 Diamonds is very fast and exciting. Since the game symbols land stacked across the reels players can easily land a few reels of matching symbols or even a full screen of identical symbols. This detail compensates for the fact that the slot lacks a classic bonus round. 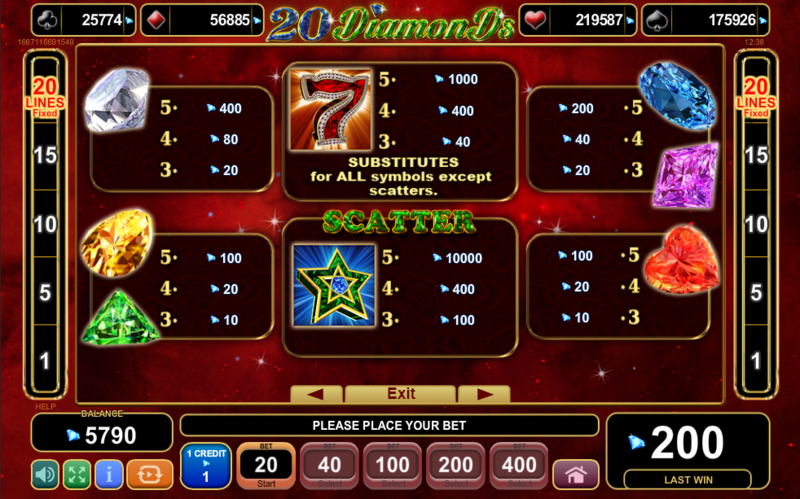 20 Diamonds is a 20 payline slot with 5 reels and 3 rows. 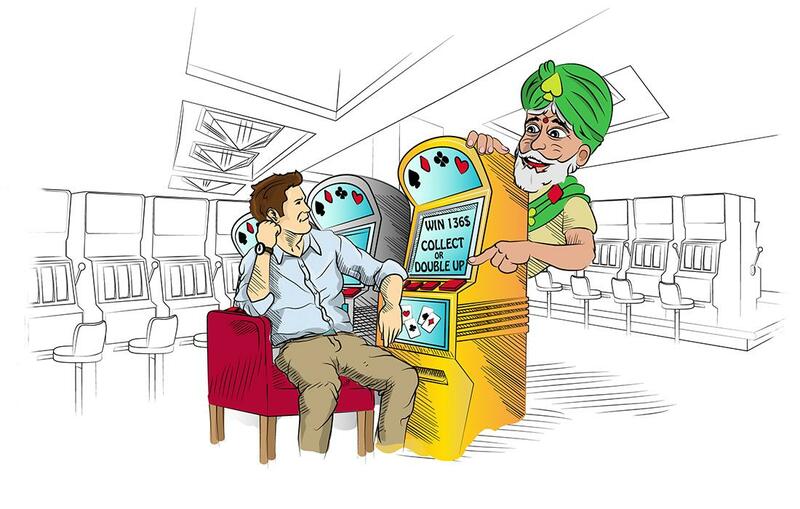 You can bet anywhere from $0.01 to $12 per spin and you can also adjust the number of pay lines from 1 to 20. The top payout in the game is set at 500 times the total stake for landing 5 scatters anywhere on the screen. The game comes with an RTP value of 95.8% and with a low to medium variance. This is one of the few EGT slots which don’t have a classic bonus round. The Scatter symbol doesn’t trigger any bonus feature and only offers a payout of up to 500 times the total stake. The Wild symbol in the game is the Seven and it can land stacked on all of the reels. The Wild symbol will replace all other symbols in the game except for the Scatter symbol. 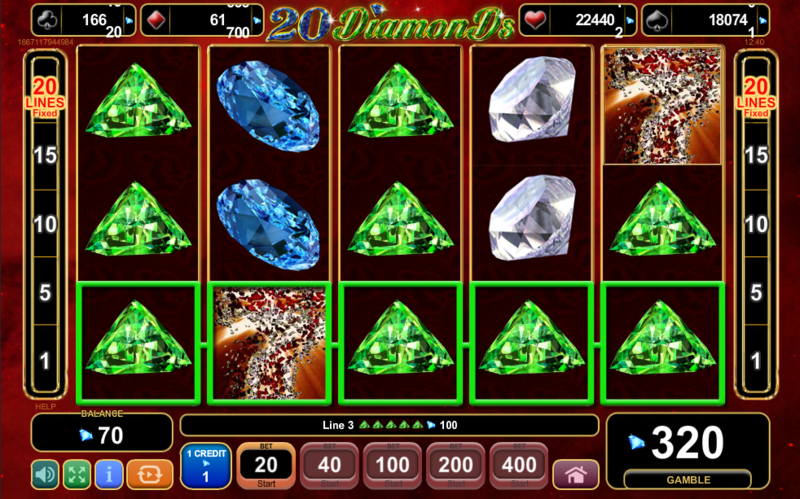 20 Diamonds also comes with four jackpots attached. The jackpot game in the slot is triggered randomly. The player will need to make picks from 12 facedown cards on the screen. Once three cards are matched the corresponding jackpot is awarded. 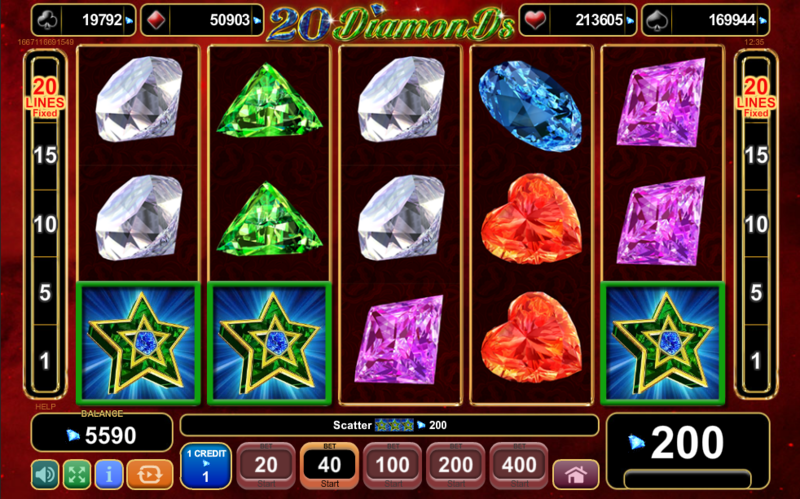 20 Diamonds is a simple video slot which doesn’t have much to offer in terms of bonus features. 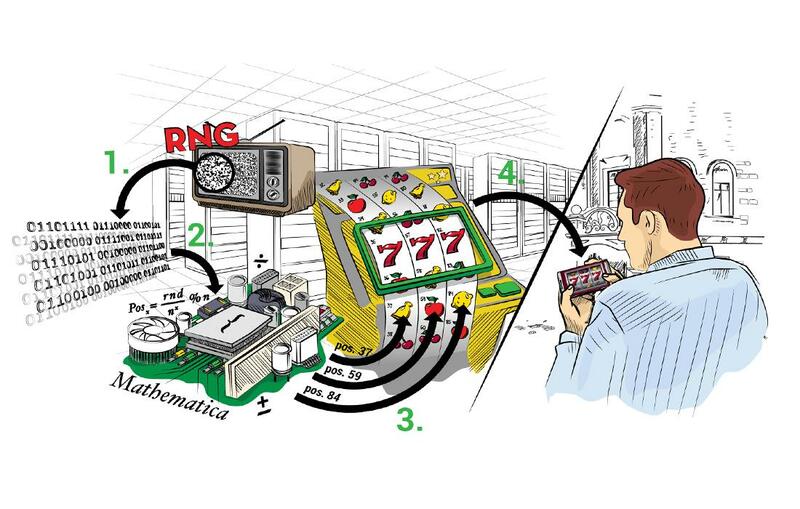 The game has a low to medium variance and a rich paytable with stacked symbols on the reels. Thanks to this detail players can land some great payouts on the reels of 20 Diamonds.